It´s one of the top-Trends, now in it´s 2nd year; leather. The Basics are the leather jacket, and of course the leather purse. But this season we are seeing leggings with leather rimmed on the side. Or Pullovers with only the shoulders in leather. It´s really: Leather, leather, everywhere! If you want to follow this, in my oppinion, awesome trend; I´d reccomend sticking to the Basics. I myself have a leather jacket and leather purses. I think they are so versatile and gives any look a huge upgrade. Here I have quick, few tips to style leather. I wear my leather jacket constantly, with anything, over anything. It just gives an outfit that little something. It also looks incredible with a scarf! And it can rock a simple white T-Shirt! 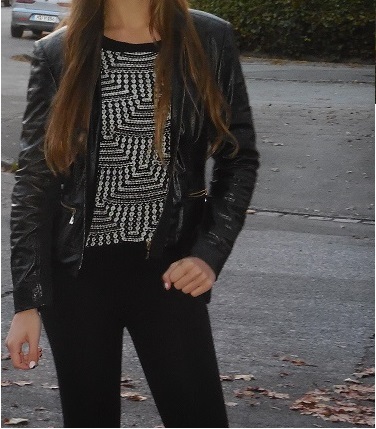 A leather jacket should be in the closet of every woman, it´s so awesome to have! Leather rimmed, or leather leggings, I´d combine with something heldback, to let the leggings play the bigger part. Maybe a one-color sweater with a scarf, perhaps in the same color as you boots or shoes, or a T-Shirt, a knit cardigan and a simple scarf. Pullovers with leather are very easy to style, you can wear almost anything with them, and the leather gives it the interesting look!